HELEN YENTUS is the Art Director of Riverhead Books. She has been designing book covers for over a decade, and her work has been featured in Print Magazine, Graphis, Communication Arts, The Creative Review, as well as by the AIGA, the Society of Illustrators, the Type Directors Club, and The London Design Museum. She has been named as one of PRINT Magazine's "20 under 30" and has received an Art Director's Club Silver Award of Art + Craft in Advertising and Design. 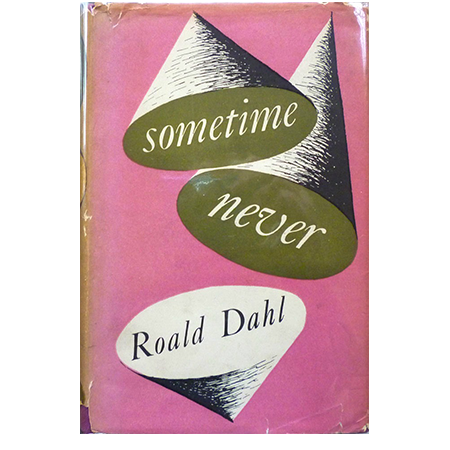 My favorite cover at the moment is this beauty by Stephen Russ, Sometime Never by Roald Dahl from 1949. I find the whole thing to be terribly pleasing. From composition to color to the strange combination of media and textures. It feels awfully well balanced and contemporary. I wish I could make something like this. So effortless and free and fun.